Personalised Badges from your Design! Our team of high-quality badge makers ensure that we can create the perfect, personalised badge for you. Just get in touch with our experienced team, and we’ll take care of the rest! No matter what your requirements are, we can create a striking, personalised badge which exceeds your expectations. Badges made from a wide variety of fabrics, using an array of media. Insight from one of the biggest names in the industry, with decades of experience in perfecting the art. 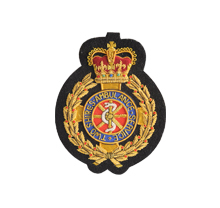 Embroidered Badges - Where the image is sewn on top of your embroidered patch. 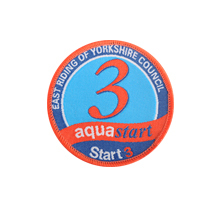 Printed Badges – Which involves a sublimation process where the print is formed within the fabric itself. 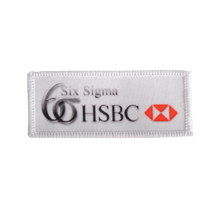 Woven Badges – Where the fabric is woven in such a way that the design is within the material, making it ideal for small text and details. Blank Badges - A range of plain badges which are ready to be adorned with your print / transfer. All our badges come in either sew-on or iron-on designs, made exactly to your specifications in order to create the ideal product for you. Badge making in the UK is a skill we have developed over numerous years, using the very best materials and the latest technology. We’re happy to help you with your order every step of the way, providing you with guidance and support from start to finish! Our embroidered patches are used in a wide range of sporting disciplines, revealing the teams’ history, as well as establishing a regional imagery and colour scheme, which helps to confirm their identity. Whether you’re starting a team or have an established one, embroidered badges are a great way to take your kit to the next level, setting you apart from the rest. Our personalised badges also make the perfect method to mark your achievements, whether you belong to a scouts group or martial arts club. How long does it take to create my personalised badge? Whether it’s a printed or embroidered badge, once your artwork has been approved, production of your badge will be only a few days in the making (subject to quantity required). Please make any urgent orders known to our customer services team, and we will try our very best to meet your deadline. Will I get to see a proof and sample? We will need you to sign off on any artwork before we produce your personalised badge, but if you require an actual sample to be produced, you can speak with our Customer Services team who will arrange for this to be sent to you. Is there an artwork set up charge? 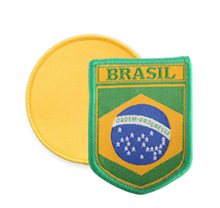 When purchasing one of our printed or embroidered patches, there is a minimum set up charge. This is a small cost, however, and can be discussed prior to ordering with our Customer Services team. Is there a minimum order for my badge? There is no minimum order for any of our badges, but there is a minimum charge for your order. Our Customer Service team will give you a costing for this in the quote for your badges. I live outside the UK can I order badges from you? Yes, of course! We have customers from all over the world, and make every effort to fulfil orders from outside the UK. We examine each case individually, so if you’re a customer based outside the UK, please get in touch to discuss things further. Do your badges come in different finishes? Each order we create is unique, and is available to be printed or embroidered as a sew-on badge or iron-on patch, offering you complete control and flexibility. If you’re looking for high-quality, low-cost badges, then call Golden Finishes today on 02920 755733 or email info@goldenfinishes.com.